Using basic tools and materials, a novice woodworker can build custom bookcases that range from simple, open back shelves that mount on a wall to a room divider that provides free-standing storage. Free plans for built-in bookcases are easy to adapt to any size space, from a simple shelving unit around a doorway to an entire library wall, including door units. Choose heavy-duty MDF and paint for sturdy, colorful shelving or beautiful hardwoods and finishes for an elegant touch. Construct built-in bookcases to add a finished look to a room, while increasing storage and display areas without taking up valuable floor space. 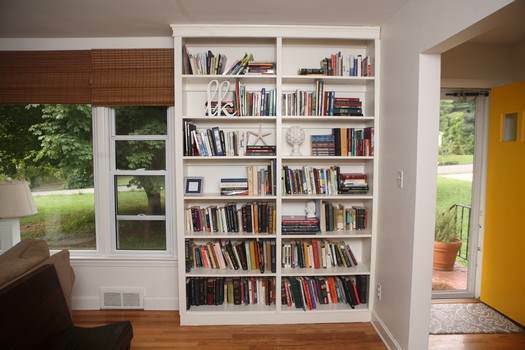 Every house can use additional storage and a built-in bookcase can be a simple project for any homeowner. Window seats and door surrounds are popular choices, with plans to fit any style and budget. 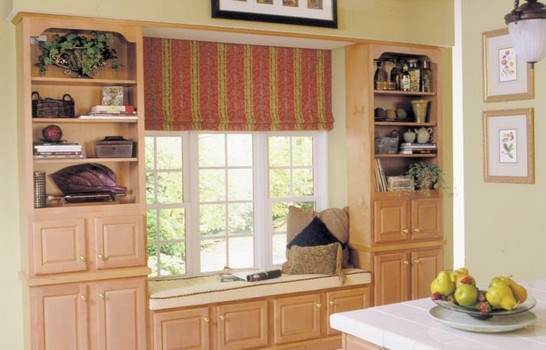 This project is for a built-in bookcase with crown molding along the top and wood trim on each side. 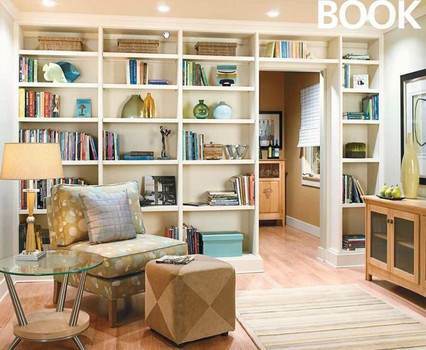 Build this modular bookcase with lower cabinets for storage, three roomy shelves on each and an optional window seat. 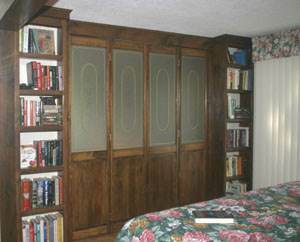 This build-in bookcase will seperate a room and provides open shelving. 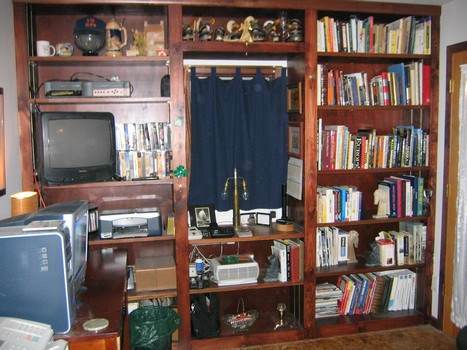 These bookcases are made without backs, anchoring them to the walls with cleats on the back of the shelves. This built-in bookcase consists of three plywood boxes fitted with a hardwood face frame. 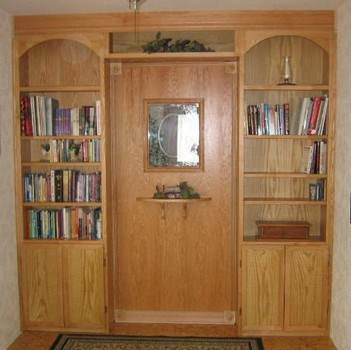 This built-in bookcase surrounds a door but plans can be customized as needed. 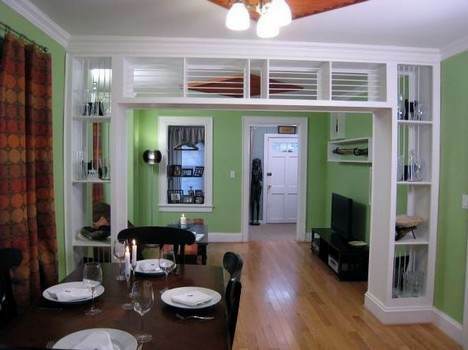 With the right plans, materials, and equipment, you can construct a built-in wall bookshelf. Photos and diagrams included. The nice thing about this project is that it takes advantage of an enormous amount of wall space that usually goes unused. This project uses basic techniques to help you build this great looking built-in bookshelf. 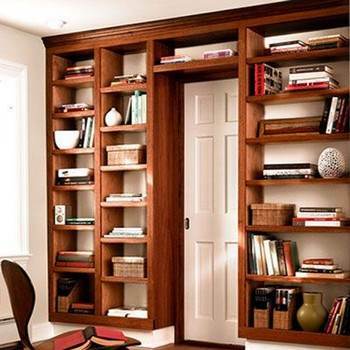 Nothing adds more to a room like custom built bookshelves.